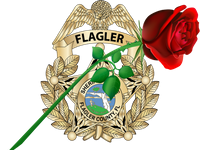 Saturday, February 27th marked the first annual Sheriff’s Gala to benefit the Flagler Sheriff’s Employee Assistance Trust (FSEAT). The event was held at the Hammock Beach Resort and was attended by more than 200 guests. Some of the top sponsors of the evening included Dr. Caesar DePaço, who is also the Honorary Consul of Portugal, The Douglas Family, Palm Coast Ford, and the Hammock Beach Resort. There was also a live auction for a Friday night ride along with the Sheriff, which included receiving Sheriff Staly’s personally autographed western hat and a day for two training and observing the FCSO SWAT team. Deputy Braxton Wall is a proactive and invaluable part of our Community Policing Division. His instincts and training have prevented several potential crimes from occurring in our community and his efforts have taken dangerous criminals off our streets and made our community a safer place to live. Deputy Brian Sheridan is a wonderful asset and a great example to the employees at the detention facility. He displayed professionalism and integrity during a difficult situation at the jail this past year. Deputy Sheridan is a true testament to our mission statement – an honor to serve and a duty to protect. Crime Analyst Shannon Sandberg has been instrumental in the success of dozens of criminal investigations in 2017 and was instrumental for the success of CRIMEMAPS. Shannon consistently demonstrates dedication, excellence and professionalism on a daily basis. COP Director Sonia Byrne consistently goes above and beyond anything you would ever expect of a volunteer. In 2017, Sonia devoted over 2,500 hours to the Flagler County Sheriff’s Office Citizen Observer Program. During the last 15 years, Sonia has volunteered over 32,000 hours. Her dedication and support are very important to the agency. Rutland rushed to the aid of two young boys who had been injured by exploding fireworks, one of whom received life-altering injuries. She immediately drove them to a nearby hospital while call 9-1-1. She is recognized for her selfless act and being a Good Samaritan by taking immediate action and getting them medical aid. A net of $70,645.28 was raised for FSEAT to benefit the men and women of the Flagler County Sheriff’s Office should. The 2nd Annual Sheriff’s Gala is scheduled for January 26, 2019 at the Hammock Beach Club.